Whatever flavour of Warhammer you enjoy, whether it's the grim scifi future of 40K or the grim fantasy past of Warhammer Fantasy (née Age of Sigmar), there's one thing that's consistent: They're grim. Like, comically, absurdly, violently dark and gory, and that's part of why they're so much fun. So kid's books are a weird path for Warhammer to go down... but it's doing so anyway. 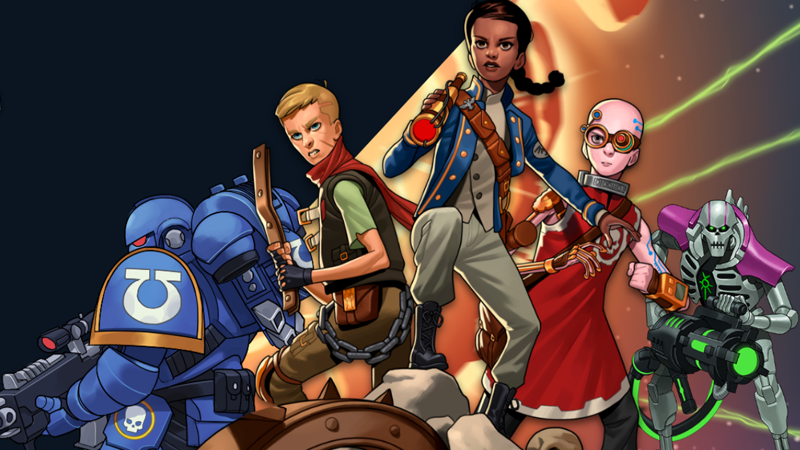 To much confusion, Games Workshop has announced Warhammer Adventures, a new kids-focused novel series set in both the 40K and Age of Sigmar settings of the beloved tabletop miniatures games; it offers fun adventures about "brave heroes battling monstrous enemies and winning great victories against impossible odds" for young readers ages 8-12. 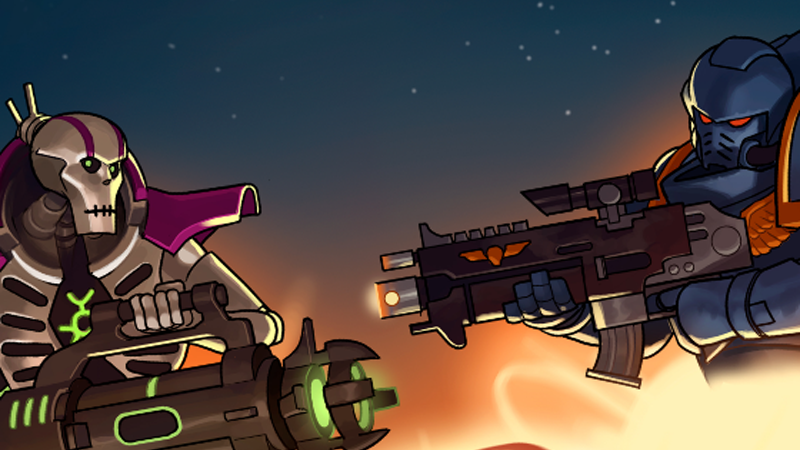 There'll be two books kicking off the range, one for each version of Warhammer. 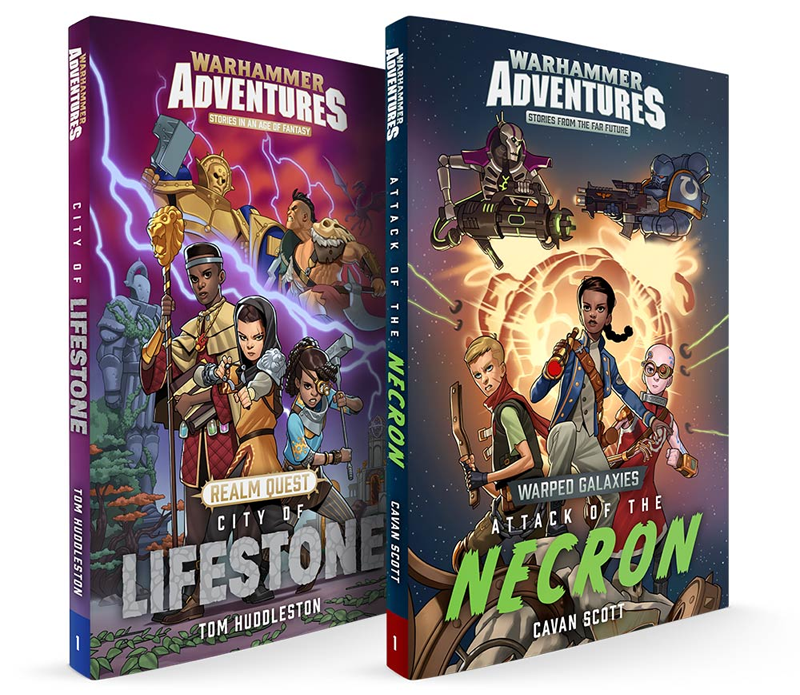 They both feature casts of plucky teens caught up in the hectic, violent wars of their respective universes (a conflict between the Space Marines and the robo-skeletal Necrons in Cavan Scott's Attack of the Necrons, and battles between the Stormcast Eternals and Darkoath Barbarians in Tom Huddleston's City of Lifestone) and... I dunno, finding triumph against adversity through the power of friendship, probably. You know, the usual fun stuff! Which is great, unless you then try to reconcile that these stories are taking place in two of the most absurdly edgelord-y, over-the-top, and brazenly gruesome fictional settings around — the worlds that coined the term "Grimdark" as a mark of honour. "Life in the 41st Millennium is hard," the splash page for Adventures' 40K stories flatly tells us - well yes, because in the tabletop game's lore, humanity is beset on all sides by constant invasions by sinister alien and demonic forces, oh, and they're ruled over by a godlike Emperor who consumes the psychic energies of a thousand people a day to keep his decaying body sitting literally embedded in the heart of a golden throne. These worlds are defined by their abject misery, the never-ending wars, and the awful, awful people (and awful, awful demonic entities) in them doing awful, awful things. It's... not really for kids, in the slightest. Which is why the announcement of the books has led to mockery from some Warhammer fans on social media about the absurdity of kids books set in these violent, bloody universes - or even worse, concerns that dreaded children might be being catered to at the expense of the franchise at large. But maybe that's the point, and why Warhammer Adventures seems like it could be a great idea, after you get over the fact it's something for kids instead of the crusty tabletop gaming fans who've been playing Warhammer games since they were teenagers and still think the idea of characters named KHARN THE BETRAYER or MALUS DARKBLADE is super cool (it totally is, by the way). Warhammer can't just be for those people forever, it has to introduce new people to its worlds in order for the games and the fiction behind them to keep thriving — to keep getting new blood in and showing them what these amazing, ridiculous settings have to offer. 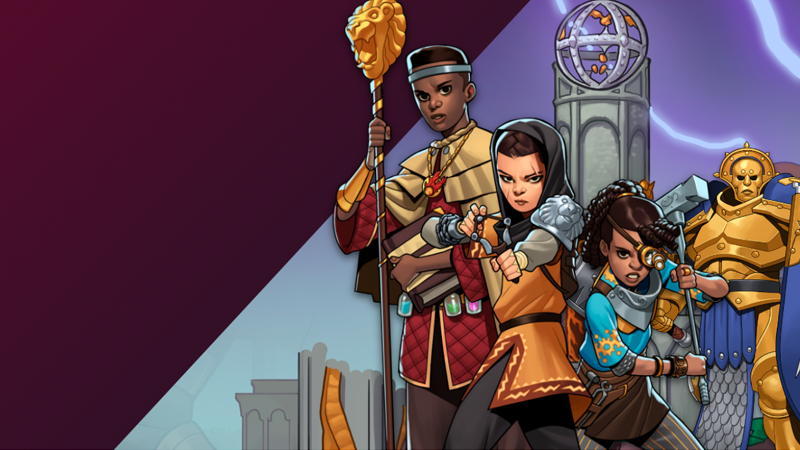 What's the harm in offering a (rightly somewhat sanitised) version that kids can enjoy as well, an avenue for exploration that could lead to them stepping up from Warhammer Adventures as kids, to Black Libary books as teens, and maybe even becoming lifelong fans? The wonderful crazy grimdark of Warhammer is still going to be around even with these kid-friendly books existing.